Pneumonia is a major cause of childhood mortality and morbidity globally – particularly in resource-poor environments – and diagnosis of pneumonia can be complex. The current gold standard diagnostic technique is a chest X-ray, looking for the presence or absence of areas of consolidation on the lungs. However X-ray facilities are not always available in remote locations. Dr. Nathaniel Meuser-Herr led a University of Minnesota research project to investigate the potential of point-of-care ultrasound as an alternative tool for the diagnosis of pneumonia in paediatric patients in Uganda, and discussed the possibilities offered by this modality. "The University of Minnesota has a long history of pediatric research in Uganda, focusing primarily on malaria and malnutrition. As an offshoot of that work, we began looking into more practical aspects of medical care, such as how new or established medical technologies could be implemented as part of the local care network. This resulted in a collaboration project with Hennepin Healthcare’s Emergency Ultrasound Fellowship and Global Health Uganda, funded by the Thrasher Research Fund, to evaluate the potential of point-of-care ultrasound as a diagnostic tool for ruling in/out pneumonia in children presenting with clinical signs of the condition. This approach has already been trialled with some success in more controlled environments, so we wanted to see if it could be effectively implemented by a local healthcare team in Uganda. Ordinarily, according to the WHO and Ugandan guidelines, children presenting with clinical signs of pneumonia are treated based on clinical symptoms alone, and imaging is only used if there are complications. We wanted to understand if the use of point-of-care ultrasound for every patient could improve both the overall diagnosis and the patient care pathway. One of the key requirements for the study was access to an ultrasound system suitable for use in a resource-poor environment, and so we approached Fujifilm SonoSite. The company donated an M-Turbo, which is ideally suited to this application, as it can run on batteries. It also has a relatively large screen, allowing several people to see the display at the same time for training purposes, which is vital for the sustainability of this type of program. Sonography training was provided to a doctor working in the Jinja Regional Referral Hospital, and all children presenting with signs of pneumonia for over a year – around 300 in total – were enrolled onto the trial. For each patient, both a chest X-ray and lung sonography were performed, and the program also funded antibiotic treatments as needed. The use of ultrasound was well received by patients and their parents, and one of the big advantages of ultrasound over X-ray in pediatric cases is that both the doctor and the parent can stay with the child during imaging, which reduces the stress involved. The scans can also be done without transfering the patient to the radiology department. We are currently in the process of analysing the data from this study, but point-of-care ultrasound certainly has the potential to help streamline paediatric pneumonia care in this type of setting –resource-poor hospitals that are already understaffed.After some training, the hospital’s medical team was also able to use the M-Turbo for a range of other activities, like triaging inpatients and referrals. They also used the system in a number of pediatric cardiology clinics, both for patient assessment and training. The M-Turbo is now providing vital imaging capabilities to a regional paediatric centre which has no access to other modalities, and will be available for future ultrasound research in the region." 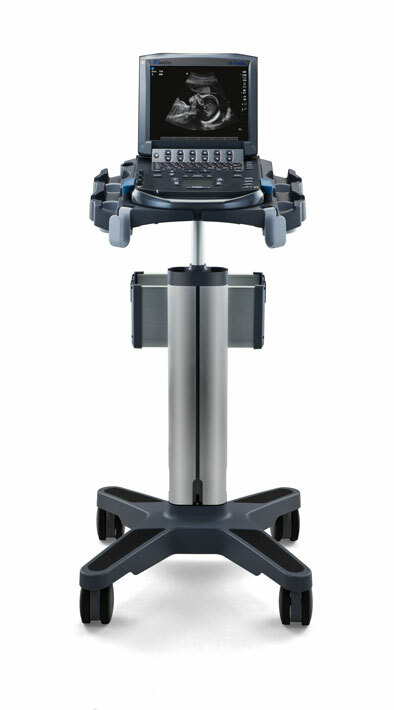 One of the most verstile portable ultrasound systems, the SonoSite M-Turbo can handle abdominal, nerve, vascular, cardiac, venous access, pelvic, or superficial imaging for high-quality exams. The M-Turbo was designed to work after a three foot drop, has a splash resistant user-interface, and is designed with battery-power and wireless capabilities for true mobility.